Do you know of a Davison Community Schools teacher or staff person who consistently goes above and beyond the call of duty? How about someone who lives the Kids First philosophy? If so, please consider nominating them for the annual Davison Educational Foundation Teacher or Staff Person of the Year. Deadline for nominations is Friday, May 31. Looking for a quality preschool experience for your 3- or 4-year-old? 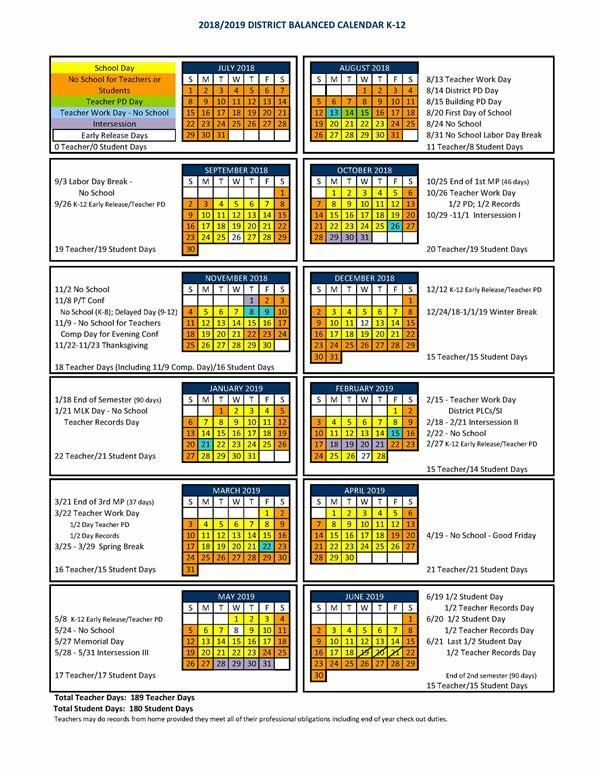 Look no further than Davison Community Schools. 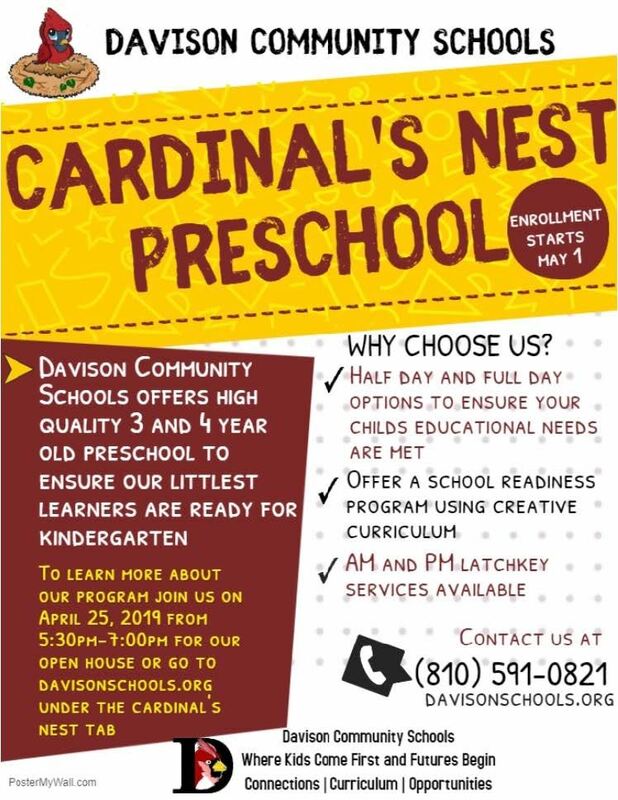 Join check out our programming at the Cardinal's Nest at our Open House from 5:30-7 p.m. Thursday, April 25. Enrollment for next school year begins May 1! 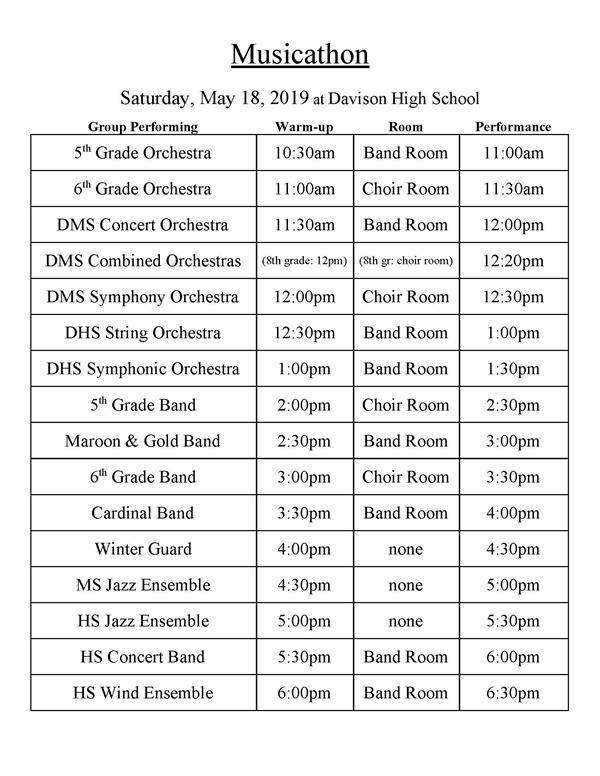 This year's Musicathon will take place on Saturday, May 18. Please see the attachment for the schedule of events. 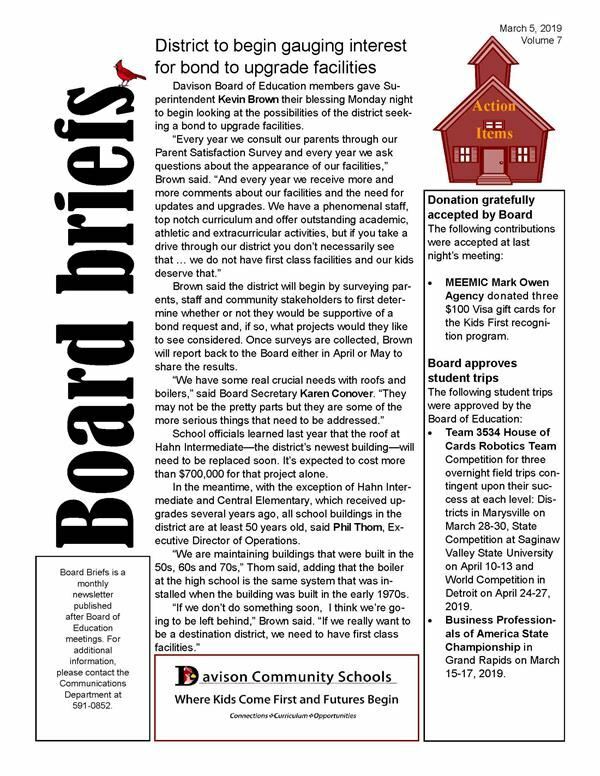 Attached please find the April edition of Board Briefs, including articles about next steps related to discussion about the district seeking a bond to improve facilities, the purchase of some long-awaited and sought after property, approval to replace the Hahn Intermediate roof and what subject areas will get updated materials and supplies as part of 2019/20 curriculum purchases. In addition, find out who the April Kids First staff member is, meet our All-State athletes and check out the cutie patooties who led the Pledge of Allegiance. Just open the attachment below for all that and more! Tickets for the Davison High School Varsity Choir's production of "Willy Wonka and the Chocolate Factory" are now for sale in the high school office. Shows are planned for 7 p.m. Thursday, May 2; Friday, May 3; and Saturday, May 4, in the Davison High School Auditorium. Tickets are $10. 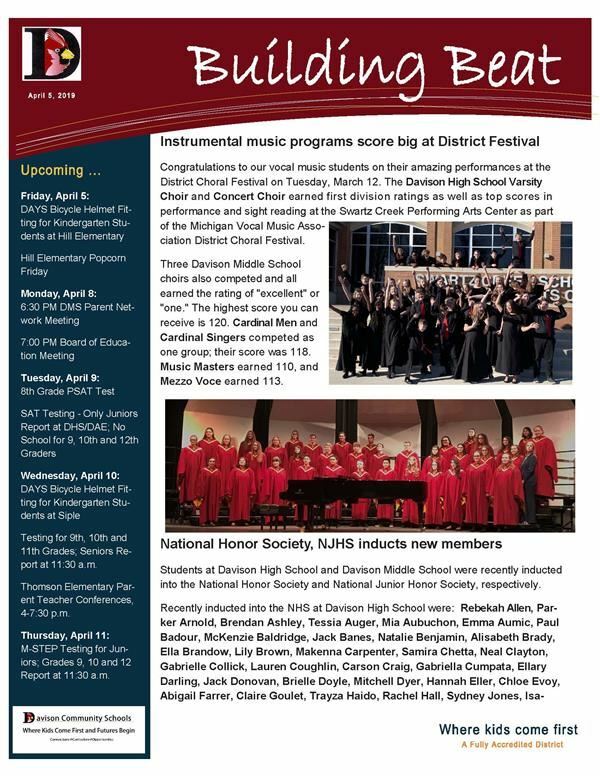 Attached please find our latest Building Beat ... including stories about our Vocal Music students, recent inductees into the National Honor Society and National Jr. Honor Society, House of Cards Robotics Team, Davison High School Student Council, Flint Area Regional Science Fair participants and Alumni News. 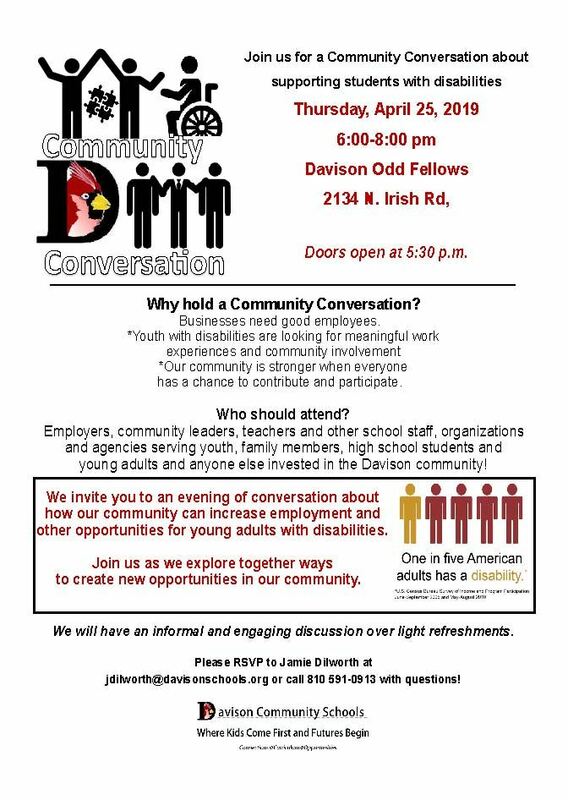 All are invited to join us at our first "Community Conversation," an event designed to join educators, businesses and community members to share ideas of how to provide opportunities for individuals with disabilities in our community and workplaces. The event will be held 6-8 p.m. Thursday, April 25, at the Odd Fellows Hall on Irish Road. Please RSVP to Jamie Dilworth at 591-0913 if you plan to attend. Thanks for your consideration! 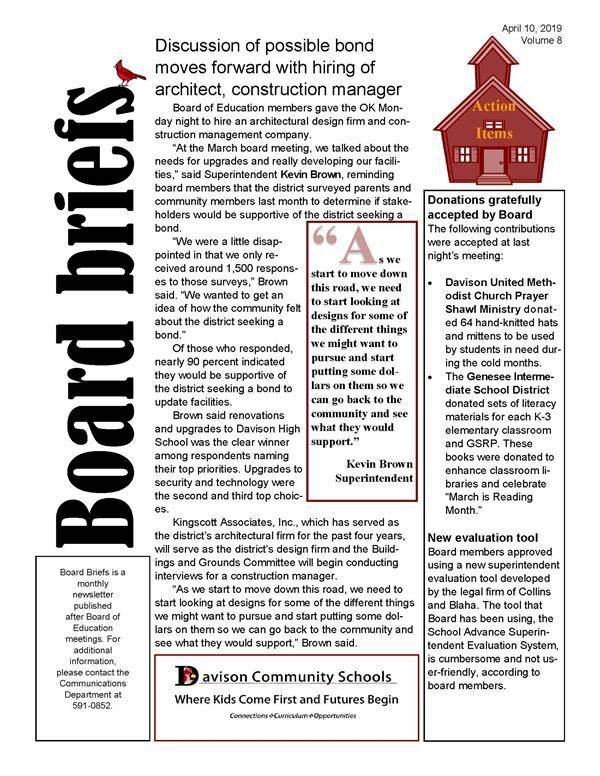 Attached please find the March edition of Board Briefs. Learn how the district will begin surveying parents, staff and stakeholders about the possibility of a bond to upgrade our facilities, find out who is the March recipient of the Kids First award and what very talented student has been named a National Merit Finalist, and be sure to check out the pictures of our Middle School students leading the Pledge. 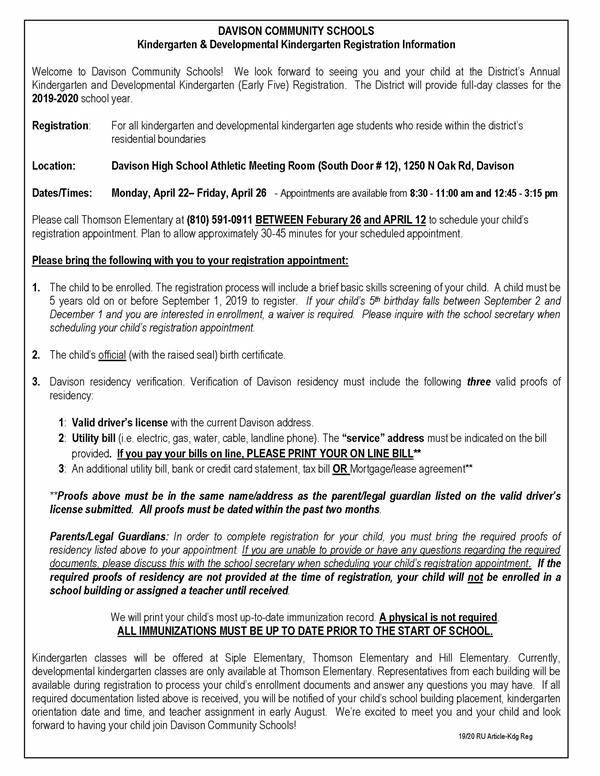 The application period for Schools of Choice will be April 29-May 10. Read here for more information. Due to the multiple weather-related school cancellations the last week of January, the nomination deadline for the Challenging Academic Potential (CAP) program has been extended to Friday, February 15. The nomination form is attached. Alumni Directory Is Being Updated! The Davison Educational Foundation has commissioned PCI to publish an updated Alumni Directory. The last Alumni Directory was published in 2002.